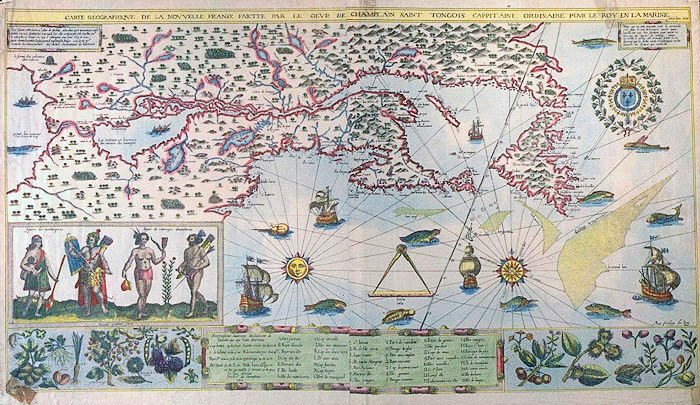 This map, his Carte Geographique de la Nouvelle France of 1612, shows the Armouchiquios, corn planters who lived west of the Sheepscot, the only images that exist of Maine's residents of this time. Also shown are some American plants. Off the coast of Newfoundland, Champlain also shows the fishing banks. It summarizes what he then knew of North America. This map is provided courtesy of the Osher Map Collection at the University of Southern Maine. See http://www.loc.gov/exhibits/treasures/trr009.html for the manuscript map by Champlain now owned by the Library of Congress.